Urge university libraries to stay open late and keep up their facilities with this student complaint letter. 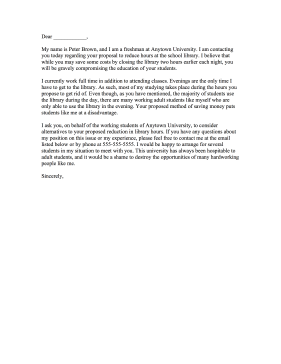 My name is Peter Brown, and I am a freshman at Anytown University. I am contacting you today regarding your proposal to reduce hours at the school library. I believe that while you may save some costs by closing the library two hours earlier each night, you will be gravely compromising the education of your students. I currently work full time in addition to attending classes. Evenings are the only time I have to get to the library. As such, most of my studying takes place during the hours you propose to get rid of. Even though, as you have mentioned, the majority of students use the library during the day, there are many working adult students like myself who are only able to use the library in the evening. Your proposed method of saving money puts students like me at a disadvantage. I ask you, on behalf of the working students of Anytown University, to consider alternatives to your proposed reduction in library hours. If you have any questions about my position on this issue or my experience, please feel free to contact me at the email listed below or by phone at 555-555-5555. I would be happy to arrange for several students in my situation to meet with you. This university has always been hospitable to adult students, and it would be a shame to destroy the opportunities of many hardworking people like me.